Welcome to this fun and educational Site Blog page on kites. Keeping you up to date with our Flight Report posts and local kite club activities. Plus interesting kite-related news stories from around the world. Finally, there will be occasional contributions from visitors, which often includes photos or links to videos. My own Flight Report videos pop up on the MBK Facebook page nearly every week. Have you noticed the What's New! box near the bottom right of most pages on this site? Running your cursor over the orange RSS symbol in that box will bring up several ways to subscribe. Click/tap on whatever option is most familiar to you and you'll never miss a post! Continue reading "A Kite Accessory Roundup"
Stronger wind speeds were forecast for later in the day so we wasted no time getting the new 'keyboard train' in the air... Think of a piano keyboard and all those black and white keys! After putting up the first 5 Tyvek-sailed and carbon-sparred diamonds I realized the order had been reversed from my original intention. But it didn't really make any difference since the order is also reversed just by observing from the other side of the train! The line was unused 100 pound braided Dacron, wound onto a simple wooden winder. The winder was long and thin in order to pass it through the central holes in the sails. Hence I started putting kites onto the line and into the air one at a time. However, at number 8 it was decided to stop right there. The breeze, although quite smooth, was gusting over 20kph and the line tension felt a bit scary! The kites were swaying around ominously, giving the drogue stabilizers a thorough workout. With half an eye on the train of diamonds, we spent some time taking in the sights and sounds of a large kite festival in progress. Being registered fliers, we were right in the thick of it with a multitude of kites both upwind and downwind of us. The jetty was packed from the entrance to the water's edge and also small groups were walking the full length of the wooden structure. The public was allowed to wander up and down the water's edge right beside the official display area. Our train was more easily seen from the inland side since it was flying over the edge of the dunes. The occasional aircraft, both fixed wing and helicopter, cruised down the coast for a view from around 500 feet. During the middle of the day the breeze smoothed out even more and lightened off slightly. This was just perfect for the train so I added the remaining 4 diamonds! And so the alternating black and white diamond kites remained in the air for hours, stretching up steeply to around 200 feet in the sunny sky. The sway had subsided to a gentle undulation. It was gratifying to see the whole thing sitting up there after some hasty painting and assembly over the previous few days! Finally, later in the afternoon, whitecaps on the ocean signalled the return of fresher winds. It was a struggle to get the first 2 or 3 kites down but then the tension eased off as less and less sail area remained in the airflow up high. In addition, wind speeds were high and even the largest kites began to list to one side. My big Multi-Dowel Box came down several times. After the first mishap, we played safe by putting the kite up on much less line. Someone claimed that there had been a gust of over 45kph! Several other smaller kites also failed to cope with the conditions. As one flier put it, it was 'box kite weather'. That's really a historical term, since today my box design wasn't doing as well as the numerous large parafoils and at least one large flowform. During one particularly fresh period, we heard a loud drawn-out sound from up high. Leaving the tent to take a look, a large header kite could be seen looping right around and heading nose-first for the sand! No damage was done and the situation was sorted soon enough. The breeze kept everyone on their toes, varying in strength from hour to hour and shifting direction. What started as a northerly with a little easterly in it shifted around to the west, in several stages. One of these shifts was so rapid that the entire field of kites could be seen to smoothly change direction over just a minute or 2 it seemed. Not wanting to fly too high, I slung the KAP rig just 15m (50ft) from the kite instead of the usual 30m (100ft). 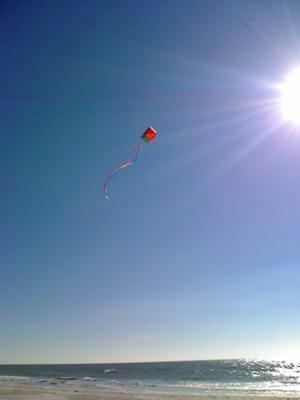 However, the normally well-behaved kite didn't like it at all and commenced to swing the cradle around. I persisted for a couple of flights, firstly taking in the field of kites to the south and then the kites to the north of our tent on the sand. This year it seemed that everyone had less trouble with tangles. Probably because the breeze was so smooth, despite all the shifting of direction and strength. The public who wandered up and down the jetty, and along the water's edge, saw a great display of many varied types of colorful kites. Large and small. Continue reading "Adelaide Kite Festival"
To begin with there was a lot of standing around while other happenings took precedence over the launching of large kites. Mind you, the kids got going early with a stall offering cheap mass-produced deltas. Many of the pure white kites were being towed around near the stall that sold them. A few got dragged roughly over the ground, making a few of us more experienced fliers wince. Why all the towing? There was practically no wind! A few of us took out our best light-wind kites and did a whole lot of line-working to try and get some air time. As thermals got stronger, I managed to loft my 2m (7ft) span Carbon Diamond right under a developing cloud. Unusually, the lift region stayed put since there was so little breeze to drift it off downwind. Hence the big diamond cruised around right overhead on the full 250 feet length from the reel. For minutes on end! It was fascinating to watch, with great ripples and bows forming in the 200 pound Dacron line as the kite moved around. A couple of large soaring birds joined the kite, but soon the creatures were 1000 feet or more above it. The birds circled, climbing steadily in the invisible bubble of warm air. Not a flap the whole time. The event was a bit disappointing from a kite-fliers perspective but the crowd definitely got to see some spectacle! Conditions were perfect for the Galt Area Historical Society’s annual Kite Day out at McFarland Living History Ranch on Sunday. Dozens of families enjoyed the conditions and open fields, while trying their hand at flying kites. Participants could bring their own kite or make one when they got to the ranch. Youngsters were taught to make their very own kites, with the help of Galt Area Historical Society members, free of charge. But the real fun started on the east field where kites went soaring, courtesy of optimal breezes. Temporary setbacks found some kites in trees and down behind farm equipment, but kids and adults alike persevered and were rewarded as their kites took flight, soaring above their heads. The Galt historical society also had lunch and, of course, ice cream from Velvet Grill available for participants. The historical society would like to thank all the local merchants that donated food and prizes, and the volunteers that helped make the day so successful. A collection of visitor-contributed photos, featuring more than one kite in flight. 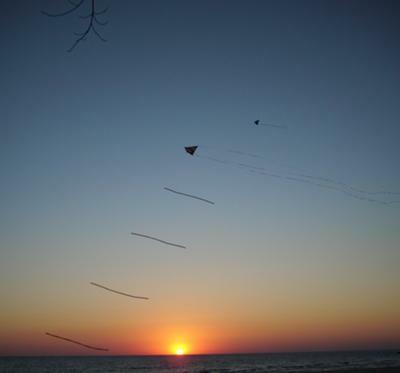 Continue reading "Mini Gallery - Multiple Kites In Flight "
A collection of visitor-contributed photos, each featuring a kite in flight. Continue reading "Mini Gallery - Single Kite In Flight"
This previously published page is a series of emailed questions and answers. Dan Leigh became well known for his series of precision-built, high-performance delta kite designs. Continue reading "An Interview With Dan Leigh"
So it would appear that a lightly-built tetrahedral does well on a towing point somewhat aft of where it is usually seen on traditional tetras. You know, those cellulars of yester-year made of sturdy dowels, cotton sails and (gasp!) metal fittings. Early on, with the sun obscured by thick cloud, the breeze registered 20kph and gusting to 26kph. A very comfortable range for most cellular kites. While waiting for patches of brighter sunlight to drift closer from way upwind, I had several attempts to trim out a pronounced lean to the right. A length of light plastic tail from the left corner helped, but the real problem was mis-aligned cells. They're all like little rudders! After the third untie/re-tie of shoelace ties, on as many cells, things were looking much better in the air. The extra tail was left on for good measure. At last some decent sunlight turned up and I made the most of the large blue hole in the sky, getting numerous camera shots from various angles. That was actually the purpose of the outing - to get the title page shot and scenic shot for the up-coming e-book Making The MBK 10-Cell Tetrahedral Kite. With close-up shots taken, more line was let out so the kite floated about 60 feet above the sand. Much more than that and it would be hard to frame up the scenic shots! Although the tide was well up, the wind direction was favorable, being SSW. Being a slightly on-shore breeze there was plenty of sand over which to fly. Meanwhile, the breeze seemed to freshen somewhat. Sure enough, with wind meter out, the speed measured 30kph gusting to 35 within a minute or 2! No wonder the tetra pitched over, touching a corner to the sand, as I brought the kite in. Fortunately nothing snapped. The idea was to test the effectiveness of a new Tyvek drogue. Yesterday didn't work out due to light wind and today was nearly the same story. However, with both kites out on generous lengths of line, they both stayed up long enough for a comparison. Although comparing the effect of the drogues on identical kites was the main idea, it turned out that the 2 sails flew rather differently as well! One kite was spanking new and un-painted while the other was older with a half-painted and probably slightly stretched sail. This older kite also had a glued horizontal spar fitting which meant the sail could not be adjusted tight like the newer kite. It took some time to get the older kite up and away with thermal gusts coming through at irregular intervals. Without at least 150 feet or so clearance from the ground there was little chance of staying up. From a high height, the kite had just enough time to catch the next gust by the time it sank to ground level! In comparison, the new all-white kite/drogue combo soared high easily - and stayed up there most of the time. Interesting, since the new drogue was definitely heavier than the plastic one on the older kite. Aerodynamic efficiency well and truly trumped the extra weight! The weight would be a boon for train flying, helping to keep the drogue away from the flying line. As if to prove this, today I was able to observe the kite in free-fall on it's face during lulls - but unable to catch up with the drogue below! Despite the difficulty in getting a clear comparison between the 2 drogues, the new Tyvek model seemed to have ample stabilizing effect. With the Adelaide International Kite Festival coming up I was also pleased to see that the sail / drogue combination looked good! The white Tyvek windsock is significantly slimmer but a little longer than the plastic one. It's also on a slightly longer tether.